Not a great film, but it does its best to provide an engaging, eye-popping, (almost) three hours of fun. I recently bought an HD television, and within the first hour had seen so many crisp, vividly detailed images that I knew it would be hard to ever go back and watch things without that advanced technology. James Cameron’s much-ballyhooed, long-anticipated Avatar feels like it should have garnered that same response, a kind of technological ecstasy that would be difficult to disregard. But the killing joke of Cameron’s new film is that for all its lush beauty and enjoyable action, the vaunted advances of its 3-D format are completely unnecessary, and sometimes a hindrance. So visually strong is the CGI artwork of Avatar that audiences will likely overlook lesser components like cardboard characterizations, ham-fisted messages and predictable plotting. But if you are in the wrong mood, those faults will absolutely ruin the experience the film offers. It is an event film, no doubt, and one that is hard not to be caught up in. 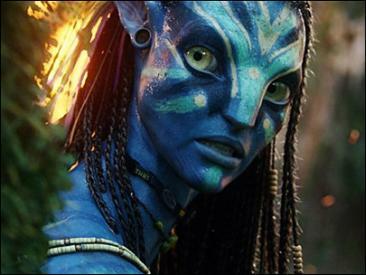 But Avatar is also such a straightforward, simple-minded film that its debits stand out like sore blue thumbs. Avatar is the rather simplistic story of a man discovering nature, and that story has been run through Hollywood a few dozen times, but never in such spectacular fashion as Cameron displays here. Jake Sully is a paraplegic Marine who is put into service on a scientific project to gain the trust of an alien race called the Na’vi, whose home world (called Pandora) is rich in an ore that will bring a tidy profit back on Earth. Sully utilizes a Na’vi avatar, or substitute body, that he can experience the world through without risking any harm at the fangs, claws, hooves or attitude of the many and varied indigenous life-forms found there. But the company running the project is supported by a para-military force that doesn’t want to wait on a diplomatic solution; they’d rather charge in, guns blazing, burn everything down and salt the earth rather than relocate the Na’vi. Sully must manage to learn from the Na’vi as well as protect them from his employers. The Na’vi are a twelve-foot tall, blue-skinned race of lithe warriors who are deeply connected to the world and species around them. Their ponytails end in small, fiber-optic cables that can link their minds with their ancestors, the very ground they walk on and several animals used as transport. This communal hive-mind connection implies an innate goodness, though they are clearly raised as warrior types similar to Native Americans or African tribesmen. They live off the land but respect it, while everyone else (read: white businessmen and soldiers) are out to destroy all that is good and natural. It’s more than a little heavy-handed, what with the “strip-mining and deforestation are bad” messages and allusions to Blackwater. You would think if Cameron wanted to make such an amateurish political statement he could have done so for less than $300 million. These too-easy narrative tactics should have been ditched for something that could have matched the loftier look and feel of the film. Sam Worthington makes Sully a sympathetic character, even if he too often falls back on jarhead dialogue that seems wrong coming from someone so displaced from his former profession and in touch with his newfound environment. Sigourney Weaver does a fine job as Grace Augustine, a pushy, unsympathetic scientist who runs the avatar program. When she wakes up and asks for a cigarette, you immediately like her. Giovanni Ribisi is the corporate rep who has no regard for anything outside a dollar sign; his character could easily be a cousin to Paul Reiser’s ill-fated company man in Aliens. And Michelle Rodriguez gets to have fun as a good-natured chopper pilot who comes in handy when things get rough. But Stephen Lang gets to chew the most scenery as Colonel Quaritch. The 57-year-old actor plays the stalwart career soldier in rare form; he’s scarred, tan, lean and mean, and he doesn’t have time to relate to the natives. The character may be one-note and terribly familiar, but Lang is fun to watch as he glares, barks and fights his way through the film. He is pure, 100% machismo with a mech-exoskeleton. For all its length, bluster and beauty, it really comes down to how those awkward glasses work. The advanced 3-D system seems to be more for increased depth perception than for the occasional object sticking into the audience’s field of vision. But the bottom line is that Cameron’s CGI is so spectacular that he didn’t need to make the film three-dimensional. I am curious to see how a 2-D version of the film will play; will some of the harder to track scenes will be less muddled, and will blurred moments of action appear more stable? James Cameron has always made immensely watchable films; some just have more emotional and dramatic potency than others. Avatar is a winning example of gorgeous visuals and catchy action that can distract you from an array of clumsier elements. But the scope of the film and the vast carnival of hype and expectation surrounding it make it hard to miss, or to dislike. Avatar is not a great film, but it does its best to provide an engaging, eye-popping, (almost) three hours of fun. And really, there’s nothing wrong with that. Originally posted at Movie Geek Feed. Republished with permission.